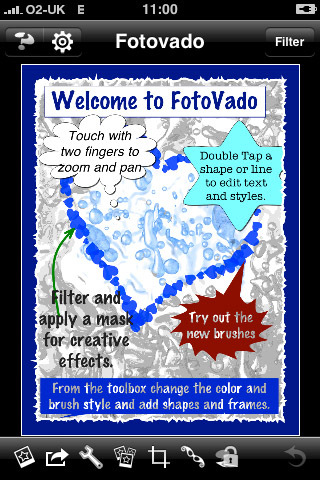 FotoVado has tons of functionality but remains simple to use. Undo all drawing, text and filter actions. The image shows the FotoVado welcome image. You can always restore the welcome image from the settings screen if you need to see it again. The main editing display operates in two modes, draw and navigate. Activate navigate mode by touching with two fingers, you can then pan and zoom around the image. After a few seconds FotoVado will revert back to draw mode automatically. If you prefer to switch modes manually by double tapping, disable 'Auto draw mode' in the settings screen. Tap the photo icon on the toolbar to select a new photo, use the toolbox ( spanner icon) to switch colors, change brushes and add text boxes.